So you work out, maybe go jogging and like to hit the gym. These are all great ways to stay in shape and keep healthy. However, all of these activities, if overdone or done regularly, can leave muscles feeling stretched, tired and sore. What can be done to avoid these issues and help our muscles recover more quickly after physical exercise? Magnesium is the 4th most abundant element in the human body and plays a key role in over 300 biochemical reactions. The main source of energy in our cells comes from an energy-bearing molecule known as adenosine triphosphate. Each of these molecules must be bound to a Magnesium ion in order to be biologically active. When transdermal Magnesium (Magnesium chloride dissolved in a carrier liquid) is applied to our skin, it is quickly absorbed and used by our body. The calming effect it offers is unlike any other mineral, with a unique ability to stimulate the production of serotonin whilst reducing stress hormones. Magnesium can even be an effective treatment for muscle spasms and cramps. This is one of the most popular ways to use Magnesium. It is very convenient and can be used right after exercise without the need for a bath or shower. Holding your spray bottle of transdermal Magnesium around 10 cm from the skin, apply a few short blasts making sure the affected area is covered in the liquid. Using your hand, massage in the Magnesium oil. This can be especially beneficial for bigger muscles in the leg. Allow the Magnesium to soak in naturally; there is no need to wash it off. Magnesium is odourless and will be completely absorbed by our bodies in a matter of minutes. This can be repeated whenever needed and is a great way to relax the muscles, ready for the next day's activities. 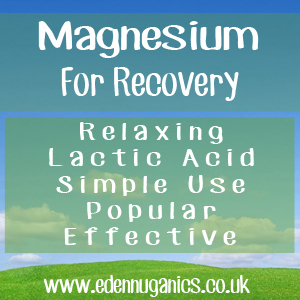 Another way of speeding up recovery with Magnesium is by adding it to bath water. Magnesium chloride will dissolve easily in water, making this a great way of treating the whole body in one go. Add one cup full of Magnesium chloride flakes to a bath filled with warm water. Allow around 5 minutes for the Magnesium to fully dissolve into the water. Once in the bath its a good idea to soak for around 15 minutes, allowing your body enough time to absorb the Magnesium from the water. This can be repeated daily while undertaking strenuous physical activities. Cherries - The powerful natural antioxidative properties of cherries make them a great choice for fast recovery. A 2010 study published in the Scandinavian Journal of Medicine and Science in Sports found that antioxidant compounds known as anthocyanins, found in tart cherries, help to reduce inflammation. Ice - Ice is one of the most effective treatments for muscle fatigue. Sometimes referred to as 'cryotherapy,' the act of applying a cold compress helps to remove lactic acid from muscles whilst helping to reduce swelling. Coffee - Although this may not seem like the best choice, studies have shown that drinking coffee before a workout can reduce muscle fatigue buy more that 50%. Don't just drink a sweetened latte though. For best results we recommend a double espresso around 10 minutes before beginning your workout. Why I Slather My Body With Magnesium Oil After Every Hard Workout.